Navigation: .click on the left side on the monument you like to see. By clicking on the little maps further down you return again to the main map. 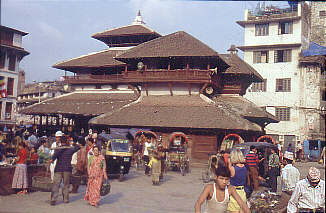 Basantapur is the main place for all the souvenir sellers . Early in the morning they are coming to install their little stalls and to deploy all their marvels. 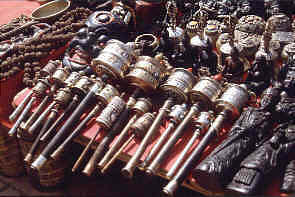 Most of the souvenirs are specially made for the tourists . 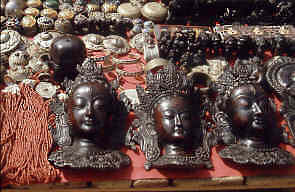 A lot of artisans and little factories are situated in Patan and Bhaktapur. So dont expect to find genuine antiques or Gurkha knives. The later are made of soft iron and useless if you want them for gardening. 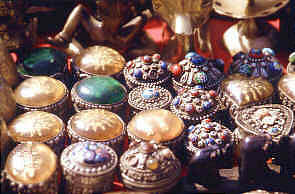 The Newars who are the original population of the valley are famous for their skills and make very nice souvenirs. Quiet a few people had to pay a lot for overweight when they flew back home. 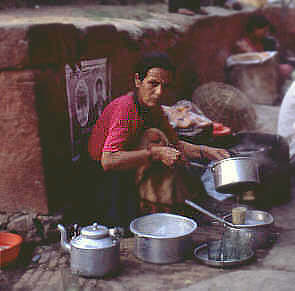 At the beginning of the place this woman runs a little tee stall. The tee leaves are boiled directly in the milk with sugar. To be sure, that all the glasses are returned to the right tee stall, they are marked witch a colour spot on the bottom. The King’s palace Hanuman Dhoka is a huge complex north Basantapur with several Buildings, Towers, and pagodas and inner court yards. On the corner to the durbar Square is the white building in Neoclassical style which was only build in the second half of the 19 th century. 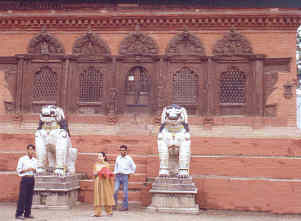 At the end of Basantapur is the house of the Kumari. She is seen as a living goddess and incarnation of Taleju.  There are some other Kumaris in the valley of Kathmandu, but this one is surely the most important. Once a year the king have to go to her during the dassain festival to get her blessings. This is the sign that he has still a legitimisation directly from the gods. The House was build in 1757. Passing the two white lions, you enter a beautiful inner courtyard with richly carved windows. If you are lucky, she will come to the window and look at you, but you are not allowed to take a picture. This is the big balcony-window where the Kumari appears, but on the picture it is someone else. The Kumari is chosen as a little girl at the age of 4-5 years. She is always coming from the sakya cast of gold- and silver smiths. But first she has to posses several qualities and virtues. Apart that her horoscope must match with the one of the king she must have a perfect body and not fear at all to see sacrificed animals. The reason is that the royal Kumari is an incarnation of Taleju which is herself a form of the bloodthirsty Goddess Dhurga. So the final test for the little girl is to go around the many heads of sacrified buffalos laying in the courtyard of Hanuman dokha while priest with horrible masks try to frighten her. If she is not frighten al all, she must be an incarnation of the goddess Dhurgha and in a night long ceremony she is purified from all sins and inthroned as the new Kumari. 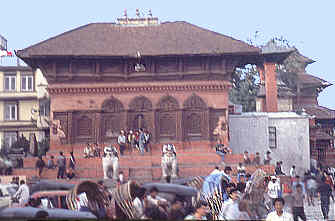 This Temple is supposed to be on of the oldest remaining houses of Kathmandu. The name means house of wood and it was formally a meeting place for the people of the surrounding villages. 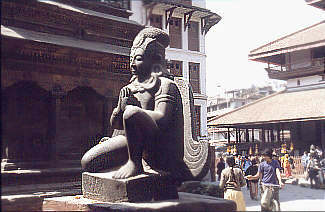 Probably it gave even the name to the place which later became Kathmandu. Still you will still find many porters in the early morning waiting here to get some work in the day, it is now a Temple dedicated to Gokharna and in the evening groups of Hindus will come to chant holy texts. 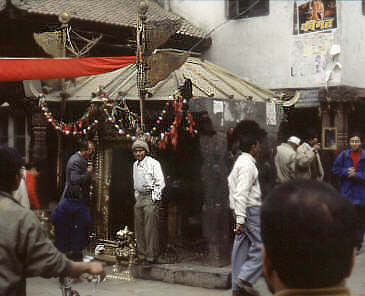 One of my favourites places on Durbar Square is the little Ganesh temple on the corner of the Kasthamandap. 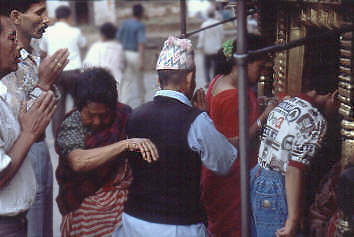 From the early morning an, devotees are coming to give some offerings to Ganesh, asking luck for a travel or a business. After giving a little offering to the god, they receive a little spot of red colour on their head, the Hindu Thikka. 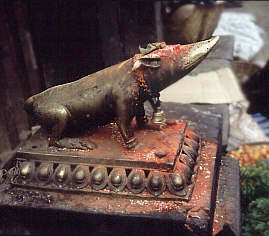 See also on the other street side the little rat , it is the vehicle of the elephant god Ganesh. 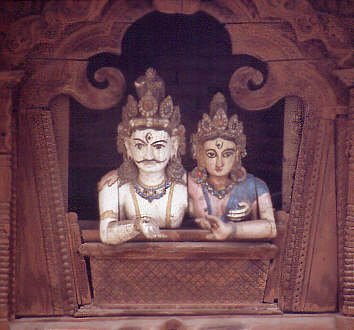 Shiva and his wife Parvati where living in the deep Forests. While shiva was away for meditation a man came to Parvati as she was bathing, as no one was guarding the door. The next she formed from the dust and creme laying on her legs a wonderful boy and gave him life. After this she ordered him to guard the door with the strict order, not to let any man come in. Unfortunaly Shiva was coming back unexpected and Ganesh barred him the way. Furious that a little god did not let him go to his wife, he cut the head. Now Parvati was very angry an she told Shiva that he has to bring life to their son. But the head could not be found anymore. So shiva send his servants to bring the head of the first living being that they would find and they brought the head of a white elephant. 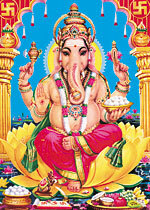 Shiva fixed it again on the body, gave again Life back and accepted Ganesh as his own son. 5. The Trailokya Mohan Temple. The Trailokya Mohan Temple was build in 1680. On the back you see a beautiful Garuda, the vehicle for Vishnu. This Temple was just build ten years later. It is dedicated to Shiva and inside you will find a famous Lingam. The steps of this temple is a favourite place to sit and watch the daily life. 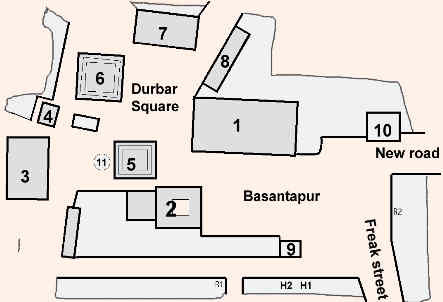 North of the place is the Shiva -Parvati Temple. They are overlooking the place, have a look where Shiva is holding his left hand! Again this Temple has fantastic carved windows and two lions guarding the entrance. On the right of the building, one can see the big bell. 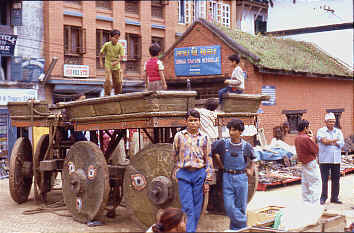 In front of the white school-building on Basantapur is the small shed where the golden carriage of the Kumari is parked during the year. 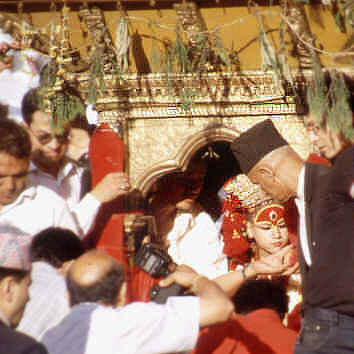 At Dassain it is taken, cleaned an decorated and the Kumari will be carried through the streets of Kathmandu. 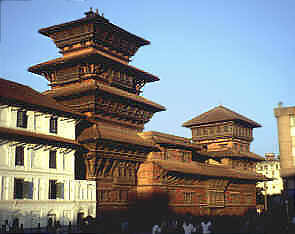 Part of the King palace Hanuman Dhoka is the Basantapur Tower overlooking the Basantapur place. 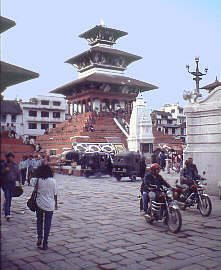 In the background you can see the Patan Tower. Both have beautiful carved Windows.